One of the Coen Brothers lesser known films in contrast to such great films such as the 2007 Academy Awards Best Picture winner ‘No Country For Old Men’, cult classic ‘The Big Lebowski’ and of course the very popular and critically acclaimed ‘Fargo’ which brought them popularity compared to their other great films in the past like ‘Blood Simple’, ‘Raising Arizona’ and…’Barton Fink’! 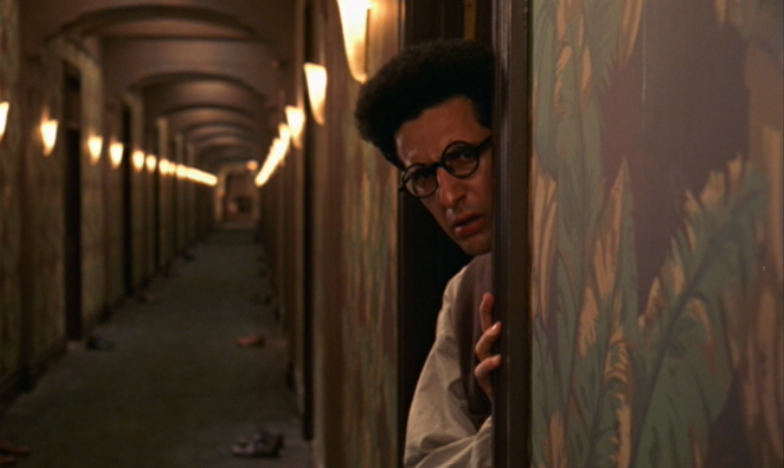 Out of all the Coen Brothers films I have seen, ‘Barton Fink’ is definitely one of their best, and as usual they bring together so many aspects of film, one minute ‘Barton Fink’ felt like a Hitchcock film, then Kubrick, then a splash of noir, then comedy and even a spark of horror! The film is set in 1941 and stars John Turturro as the title character, an acclaimed playwright from New York who writes about and for “the common man”. He is then hired to write scripts a film studio in Hollywood, checks in the fading Hotel Earle and begins to suffer from writer’s block as he develops a friendship with his very friendly neighbour Charlie (John Goodman). There’s so much to this film which makes it so special. The many themes emphasised throughout are repeated over and over such as the dark contrasts between Hollywood and Broadway in that Hollywood is a much more manipulative place which obsesses over creative control over the notion of creating art. The Hotel Earle as an example of justification clearly presents that Barton wants to live somewhere “less Hollywood”. The Coen brothers frequent D.O.P. Roger Deakins provides beyond beautiful cinematography who creates an atmosphere within the hotel which I found profoundly unsettling such as the camera frequently returning to close ups of Barton stressed over writing his wrestling epic to his encounters with mosquitos and of course, returns again and again to the peeling wallpaper in Barton’s room which has a texture almost like decomposition. John Turturro gives an outstanding performance as Barton who clearly suggests the desperation of creating important art, not only that, but Turturro significantly implies that Barton can’t be a slave to a place like Hollywood. Frequent collaborator of the Coens, John Goodman portrayal of the common and larger than life Charlie is also very well played, providing a character who clearly has much less than Barton but seems to be the kind of guy who loves taking interest in people and helping someone in anyway he can. An astonishing piece of cinema and deserved winner of Best Director, Best Actor and the Palme d’Or at Cannes, I highly recommend watching if you’re love the work of the Coen Brothers or a fan of various genres of film. Enigmatic, disturbing and very funny!